I thought that for today’s blog post, I would share with you guys my 10-minute makeup look that I have been doing every single morning. I used to love nothing more than sitting down at my vanity each morning and doing a really in-depth makeup look, but nowadays I would much rather have an extra half an hour in bed than be sat painting my face. So, over the past couple of months I have adopted a makeup look that I can get on and finished within just 10 minutes and it has been an absolute lifesaver at the moment. Plus, all of the products that I use to do this are some of my tried and tested favourites that I have been using for many years and I know that they are going to hold up well and last all day on my skin! First up, I like to start by prepping the skin with my Charlotte Tilbury Wonder Glow Primer. I love this stuff because it primes my skin and gets it all ready for my foundation, but at the same time it makes my skin look lovely and glowing. Some days, I will just wear Wonder Glow without any foundation on top because I love how it makes my skin look. Once my skin is nice and prepped I will then go in with my Hourglass Vanish Foundation Stick. I just draw random lines all over my face and then I blend it in using my Tarte Buffing Brush. Once that has been worked into the skin I then like to take my Nars Soft Matte Concealers on any problem areas or underneath the eyes. Finally, to lock that all into place, I will take my Hourglass Veil Translucent Powder, this just means that it won't transfer or budge throughout the day! I then like to move onto my eyebrows and for that I take the product that I have been using now for years and that is the Benefit Precisely My Brow Pencil. I love that specific pencil because it has great colour pay off, you don’t need to press on overly hard to create the lines and you can get a very natural and full look using this pencil. I then run through with some Anastasia Clear Brow gel to hold all of the brow hairs into place. I love this combination and I have been using them together for well over a year and I think that they just work so well together. I really am in love with how my brows look since I started using these two together. Once my brows are all done, I move onto the eyes. I never do anything elaborate, just enough to lightly define the eyes. I like to start with the warm brown shade from my Tarte x Aspyn palette through the crease and that is pretty much it. If I was a little more definition, I may take a small amount of the deep brown into the outer corner, but that will be about it. Once my shadow is in place, I will then take my MAC Teddy Kohl pencil and lightly line the upper lash line to create a little definition without having to go in with a black liquid eyeliner. Then for my lashes I have been using my good old favourite, the Benefit They’re Real Mascara. To add some definition back into the face, I like to take my Kat Von D Shade and Light palette and it just helps to bring some life into my face. I go in with the bronzer shade to warm up my complexion and then the deepest shade from the palette to lightly chisel out my cheekbones and under my jawline. If I feel like I need it, I will then add the light banana shade underneath my eyes to brighten and help hide any darkness that may be peaking through. To then add a little glow to my skin, I like to take a small amount of my Too Faced Sweet Heart Bronzer and just lightly dust this on the high points of my skin where I want there to be a little sheen. Next, to finish the whole look, I just add a slick of my trusty Nivea Lip Balm to my lips. This really is one of the quickest makeups looks that I have ever done, and I think that it makes my skin look absolutely incredible. I have been wearing this for quite a while now and it has never let me down, which is why I keep doing back to the same products and the same kind of look. Make sure to leave me a comment down below and let me know what your go to products are when it comes to a quick and simple makeup look! Thanks for sharing your 10 minute routine. I usually don't touch my crease but I'll try that step out. It seems to help hell of a lot for me! It is absolutely amazing, I love it! I definitely love to take my time when doing my makeup. I find something so relaxing about the process of doing makeup and doing all these extra steps. But when it comes to the morning I totally agree with you, extra sleep wins over makeup. I do too, I could sit for hours doing my makeup! great post! sounds like a great makeup routine! It just works for me really well! It is, I know that my makeup will always look good using these! I like using the benefit brow pencil too! They are amazing pencils, they work wonders! They really are, they make or break a face! It is absolutely amazing, I cannot stop using it! 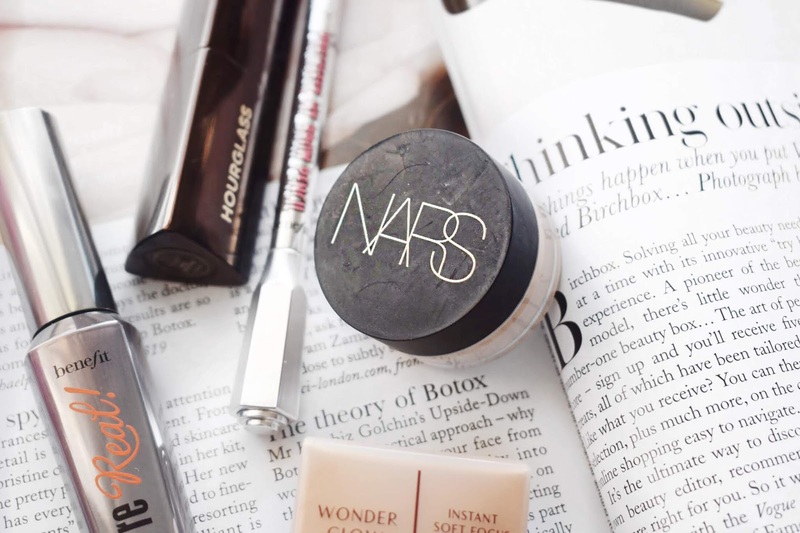 The Nars concealer is perfect for busy mornings - so quick and easy to apply! It is an essential in my makeup collection! I wear concealer pretty much everyday whenever I wear make that is, followed by setting powder, some mascara , blush and a gloss and I'm ready in a jiffy. Oh and some brow setting gel from hourglass. A concealer is such an essential to me and the Nars is amazing! I love the Collection one too, it is amazing quality for the price!